If you've read my blog long, you've probably noticed that one of my absolute favorite genres of books is Christian nonfiction. I love how the writers of this books give me a different perspective and help me to better understand what I'm reading in the Bible. They use real life examples and scriptural references to really help me to understand how these stories I read in the Bible apply to me. One of my favorite Christian writers has been- by far- Max Lucado. I so often find myself reading his works and feeling as though they were written just for me- providing just what I needed to read at any given time. He has such a way with words that I couldn't get enough. From his children's books to his nonfiction, I've not yet read a book that I didn't fall in love with. That was something I wanted to share with others too. As I said, in many ways, Max's writing has spoken to me and provided just what I needed to hear. These books are such a great 'pocket sized' way of spreading those words to others. Okay, okay...they're too big to fit into most pockets, but they are perfect for tossing into a purse for those moments you need a little extra encouragement. They aren't long reads, but truly do provide great scriptures and prayers that will be beneficial to the intended audience. Personally, I love the book for Moms. This book is most relevant to my life, and a great gift for Mother's Day, or any day! But there truly is a book for everyone. With graduation day quickly approaching, the book for grads is ideal. End of the school year teacher gifts? 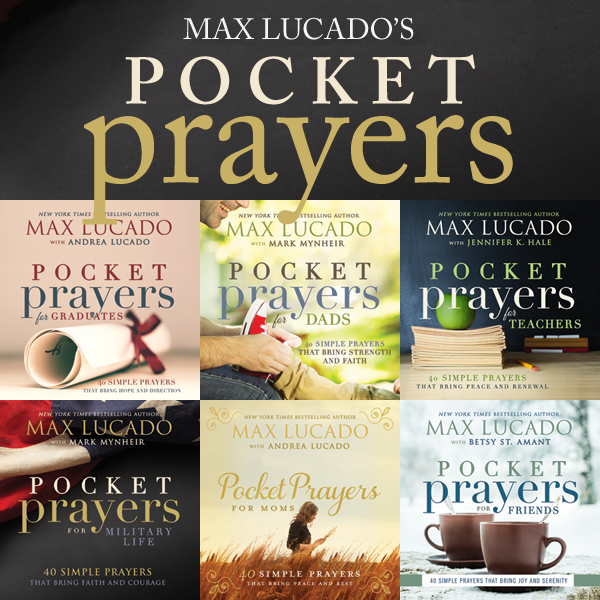 Why not Pocket Prayers for Teachers is a great way of saying thank you. Dads, servicemembers and friends...there are prayers just for them too. Each book provides great encouragement that best fits each groups needs. I love short, simple and impactful!! Just what I need on days when Im struggling! !